Perhaps worried about potential lawsuits, Netflix has taken to Twitter to issue a warning advising people not to hurt themselves while undertaking the 'Bird Box Challenge', which is – allegedly – the latest internet craze currently making the rounds on social media. Inspired by Netflix's popular new Original science-fiction film starring Sandra Bullock, in which a mysterious phenomenon causes mass suicides once witnessed, the Bird Box Challenge has reportedly influenced people to photograph and record themselves wandering around blindly while wearing blindfolds. Admittedly, we haven't seen much evidence of the Bird Box challenge being an actual 'thing', aside from one video of a toddler running into a wall and the odd sarcastic tweet, as spotted by CNET. That said, the potential for someone to wander into traffic or off a cliff while wearing a blindfold is obviously there. Judging from the Tweets, it doesn’t actually seem like anyone has been seriously undertaking the challenge, so Netflix may actually end up doing more harm than good by calling attention it. 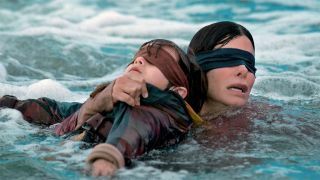 Previously, Netflix was forced to deny accusations that it had manufactured memes in an effort to promote Bird Box, which the streaming giant says has been viewed by over 45 million accounts since its release on December 21.